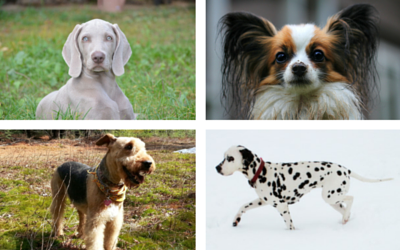 If you’ve ever owned one of the following dog breeds, you’ve probably heard the nickname they are associated with. But you might not know why they have that nickname, and if you don’t own one of these particular breeds, you may not have been aware that these breed nicknames even existed! The clear part of this nickname comes the distinctive grey color of Weimaraners. What’s less obvious, however, is where the “ghost” arises from. Weimaraners were originally bred as hunting dogs for German noblemen. Their quiet and stealthy style of hunting, as well as their haunting grey eyes, earned them the ghost monicker. As every Boxer owner can confirm, Boxers stay youthful and exuberant long after they’ve grown out of puppyhood. This young personality is what prompted the Boxer to be nicknamed after the eternally young Peter Pan. The plum pudding nickname arises from the Dalmation’s spotted coat, while the Firehouse Dog is the perfect nickname for a dog frequently found working alongside firefighters. With their large wing-like ears, it’s no surprise that the Papillon is also called the Butterfly Dog, and it becomes even less surprising when you learn what papillon means in French –butterfly! This ancient dog is one of the oldest known breeds still in existence. While their actual age is uncertain, the Afghan is thought to have been mentioned and depicted in art as far back as 4000 years ago. In legend, the Afghan Hound was the dog rescued from the great flood on Noah’s Ark. Afghans are also referred to as the King of Dogs due to their elegant manner and majestic coats. These tough guard dogs, a cross between bulldogs and mastiffs, were originally bred to protect gamekeepers against roving gangs of game poachers. The origins of this nickname are somewhat unclear. Some believe that the Great Dane originally appeared on Roman coins, resulting in the nickname of a Roman god. More commonly though, it is assumed that the Great Dane is called the Apollo of Dogs because it resembles the god Apollo with its sleek and athletic build. Some other popular nicknames for dog breeds include the Diehard, the Starter, the Royal Dog of Egypt, and the Dutch Barge Dog. Can you guess which breeds these nicknames belong to?